Many a times you will come across a requirement wherein you need to restrict user from entering future or past date in a List or Document Library Date column. 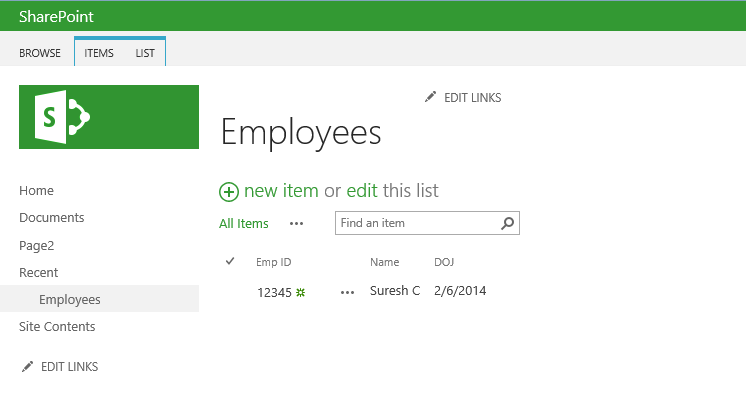 I have a list which stores Employee details like Employee Number, Name and Date of Joining. Here I need to enure that Date of Joining will not accept future date. Navigate to List Settings -> Validation Settings. 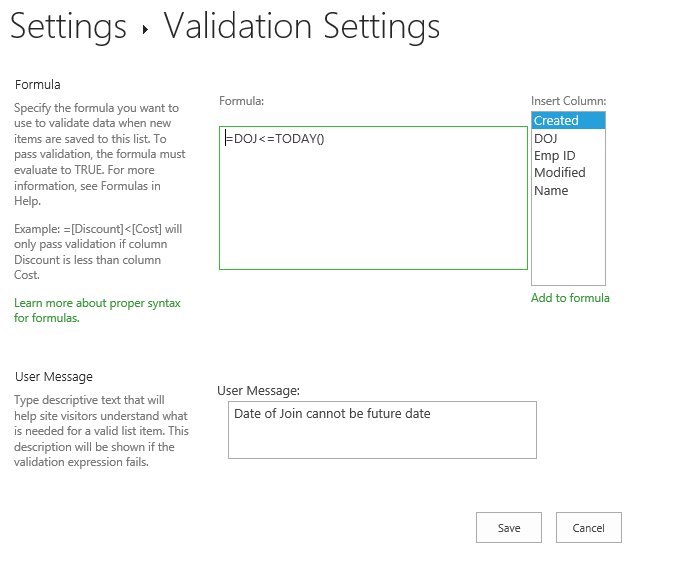 Here you can enter the formula to restrict future date as shown below. If you change the logical operator, it will restrict past date. Also, you can put message which will be displayed to user. 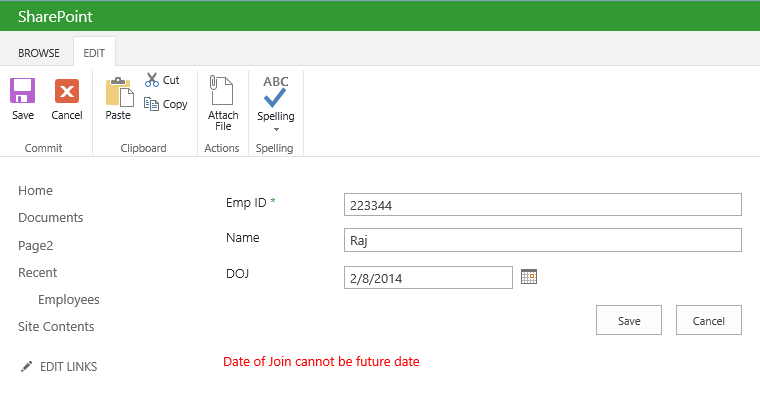 Now, when you try to enter future date and try Save, you will see the validation message. So, next time you have similar requirement, you know where to try first before jumping into coding! Bhuvanendran, what exactly is your question? Can you explain what exactly your requirement is? Suresh, Actually I have created one custom list in wss 3.0 for daily call log report. Here Reporting and closing time there are two field is there. Reporting Date & time should be today or past date is 18/1/2016 or 17/1/2016 and closing time is 18/1/2016 or greater (19/1/2016 ) and it should not be past date . 1. I tried this formula myself before posting and it worked. You need to use this formula under List Validation (as explained in this blog post), and not Column Validation. 2. I tried this formula in SP2013 and not in WSS 3.0. Can you confirm you tried as mentioned in point 1? No actually in wss3.0 there is no validation settings while creating the column there is an option like calculate value .Here only i tried . Let me know Is there any formula syntax is different for wss3.0 . Calculate value is to derive default date based on a calculation. As far as I know, it cannot be used for validation.